A FINANCIAL TIMES BOOK OF THE YEAR 2017 'This is the first physical manifestation of a much-loved online magazine that is a monument to Fox's obsessions. One for the bedside table.' - FINANCIAL TIMES 'This book is the product of a ludicrously obsessive and greedy mind - it is therefore an utter joy.' - JAY RAYNER 'Your consummate culinary guide' - THE GUARDIAN 'A vital work from a keen mind full to brimming with wonderful thoughts and ideas.' - JEREMY LEE 'The most original, entertaining and downright fascinating book.' - DAVE BROOM 'Exercise caution before you buy this book. In fact, be careful about even flipping it open. You think Instagram is addictive? Ha. This book is as essential and educational as it is delightful and weird, and I need someone to come rescue me immediately because I cannot seem to put the damn thing down.' - JEFF GORDINIER, FOOD & DRINKS EDITOR, ESQUIRE MAGAZINE 'Going beyond the usual food fixations, the book is presented in a fresh, visually inventive style that will appeal to anyone with even a passing interest in food.' - DARINA ALLEN, IRISH EXAMINER gannetnoun1. a large seabird with mainly white plumage, which catches fish by plunging into the water. 2. British informal, a greedy person.The Gannet's Gastronomic Miscellany goes beyond the usual food fixations. Presented in a fresh, visually inventive style, it will appeal to anyone with a passing interest in food - which, in this gastronomy-obsessed age, is pretty much all of us. 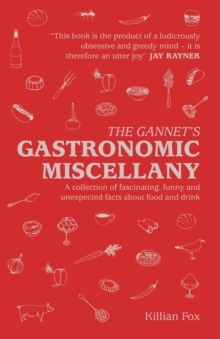 In this compendious hotpot of a book you'll find a guide to creating a hit food profile on Instagram, a cross-section of a tiffin box, an explainer on craft beer, the origin story of Chicken Marengo, a list of millennia-old products that are still edible today (should you be brave enough to try Irish bog butter or Ancient Egyptian honey) and many more delightful nuggets of information.